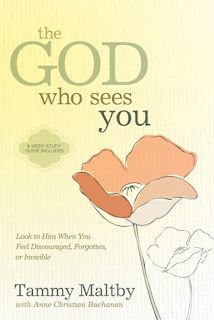 Goodreads description—For anyone who ever feels invisible, unnoticed, or unappreciated, here’s an invitation to rediscover the biblical God who sees you. Tammy Maltby wants women to know their lives matter. So she invites you to explore the real life implications of knowing God sees you. He loves you passionately, and He’s intimately involved with every aspect of your life. God wants you to see Him too and to partner with you in bringing about His kingdom. When you take this reality to heart, you will live more honestly, confidently, and fearlessly—because everything looks different once you really see the God who sees you. First of all, I’d like to say that I wish the description above didn’t single out that the author is speaking to women, because honestly, I didn’t get that vibe while I was reading this one. I really feel like this book can be equally addressed to both men and women, and nothing in there speaks specifically to women only. It’s almost downright odd that the description singles out women. Oh well. Now that I’ve gotten the negative out of the way, let’s move on to happy things. Knowing God sees you can be a comforting though. When you feel like no one else sees you, or no one else knows the “real” you, God does. And not only does He see you, but He cares about you, me, enough to know the number of hairs on your head. And He doesn’t stop there either, He’s active in your lives. But, knowing God sees you can also be a fearful and humbling experience when you’re not living your life the way He’s called you to live it. After all, it is a scary thing to fall into the hands of the living God (Hebrews 10:31), but you don’t have to worry about falling if you’re already there (John 10:29). Whether God seeing you is a scary or comforting thought all depends on your attitude, your heart, and the way you live your life. Throughout this book, Tammy Maltby discusses the reasons why we hide, the difference between reverence and fear, the concept of being God-blind, and obviously what it means to be seen by God. Tammy Maltby pulls the idea of being seen by God from the story of Hagar in the Old Testament. I love how some people are capable of drawing out these massive ideas and concept that God created and placed within single phrases that some of us pass over without a second thought. I wasn’t far into the reading of this book before I got chills—you know the ones that tell you what you’re experiencing is special. What’s more special than realizing and focusing on the fact that God, the Almighty Creator of the universe, sees me? The Message (paraphrase) – God made my life complete when I placed all the pieces before him. When I got my act together, he gave me a fresh start. … God rewrote the text of my life when I opened the book of my heart to his eyes. NIV (direct) – The LORD has dealt with me according to my righteousness; according to the cleanness of my hands he has rewarded me. … The LORD has rewarded me according to my righteousness, according to the cleanness of my hands in his sight. NKJV (direct) – The Lord rewarded me according to my righteousness; According to the cleanness of my hands He has recompensed me. …Therefore the Lord has recompensed me according to my righteousness, According to the cleanness of my hands in His sight. NASB (direct) – the LORD has rewarded me according to my righteousness; According to the cleanness of my hands He has recompensed me. … Therefore the LORD has recompensed me according to my righteousness, According to the cleanness of my hands in His eye. As you can see, The Message version is vastly different from the direct translations, and when all else fails, I trust the direct translation of the Word of God over some man’s summarization. And that’s all I’ll say about that. ††As always, my disclosure anytime I review a book related to a spiritual topic: There’s always a possibility of man misunderstanding God’s Word--self-included. I will always refer you back to the Source, which is the Bible, for the authority on these topics. In this particular case, while I’d recommend this book to others, if you really want to learn about the God Who Sees You, the best place for you to be is in His Word, His book.